Audience in Mostar had a chance to see on Monday, November 28th, a tough, intimate and touching documentary “Sve je bio dobar san”, while we could learn more about the story a day later, in the Movie Discussions organized by the MOFF. The film is studying events from the time of the war in Croatia and the arrival of young French volunteer Jean-Michel Nicolier in Croatia, his struggle, the tragedy of the defense of the town of Vukovar and the martyrdom at Ovčara. All that through the emotional vision of his mother, Lyliane Fournier, and her struggle to come to the remains of his son and duly buried him. “The power of this story, which is universal, lies in the fact that we have been able to show a different truth about the Homeland War. 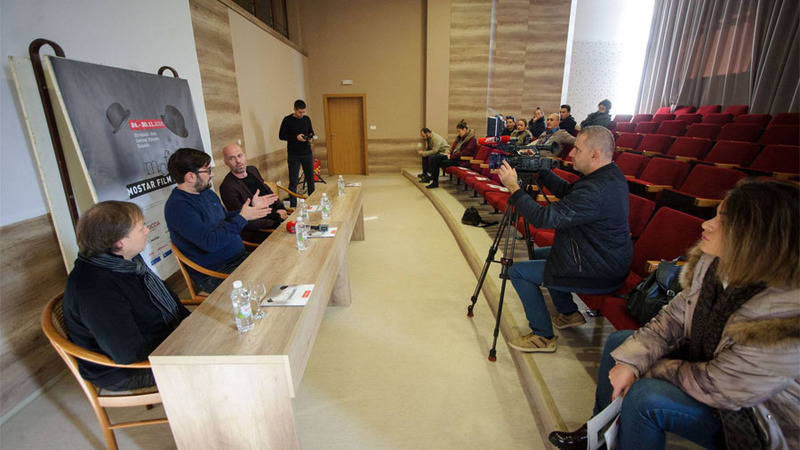 Strangers had to come and point us to the values that we have, and to bring the story of how they see us in the war and the struggle for freedom”, said director Branko Ištvancic about the film admitting that he expected for screening of his movie to cause more public interest. In the Movie Discussions actor Velibor Topić, the president of this year’s jury of Mostar Film Festival, spoke about a strong Competition program also stressing the documentary program DocuSpectre. “This year’s selection was very good; we can freely say it’s the best of the best at this time. There are some films that are in the competition for the Oscar prize, some of them were rewarded at Venice Film Festival, but we have not made the decisions yet, and I can safely say that the choice will be very difficult”, was the commentary of this year’s feature film program by Topić. Asked about the relationship between documentary and feature films, both guests, Ištvančić and Topić, agreed that the program in both categories was equally strong and that the countries of the region, in line with the trends taking place in the West, came out of the shadows when it comes to documentary production. ”The standards of the West are reaching us. For a long time, the documentary has been unfairly neglected, and it should be known that, although it costs less financially, it is no less difficult to shot than the feature film. Just in the direction of the documentary film you have to show how much you are the director or the filmmaker“, commented Ištvančić, who has a rich career with a large number of feature-length but also children’s films such as “The Ghost in the Swamp”, a film screened at this year’s MOFF. At the very end, the guests touched by the themes of production and the quality of what Bosnia and Herzegovina and the other countries of the region can offer today in relation to the visual progress that take place in the world. “We’ve always been good at producing; we’ve had very good DP-s, let’s just remember the movie ‘The Battle of Neretva’. I can freely state that today we are going in step with that what’s going on out there. Our big problem is the fact that everything is working on our mutual deal, while there is a practice in the world that everything is done by contract”, concluded Topić.